Due to high energy costs, energy efficiency is not just an an ecological imperative. The insulation used in domestic refrigerators and freezers is an all-important factor in achieving energy-efficiency qualification. 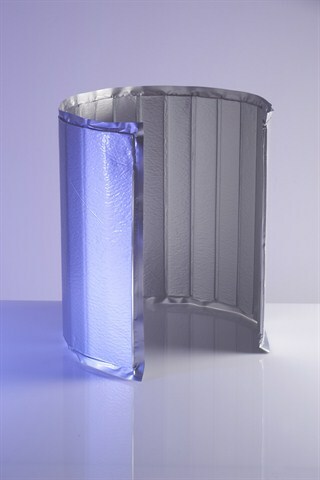 As a new technology, TURVAC® Vacuum insulation panels, enable reduction of the energy consumption of an A-class product. With specific installation of VIPs Turvac FG™ and Turvac SI™ home appliances could therefore achieve "A+"," A++" and "A+++" classes. Vacuum insulation panels are mostly used for insulating refrigerators and freezers. Using VIPs can reduce energy consumption between 8 - 30 %, resulting in higher energy classes and the same volume of the appliance. Depending on the appliance's design, over 20% of inside volume can be gained (see picture). new design of the doors- thinner walls and the same energy efficiency. Due to excellent insulation results even with a thin insulation layer many household appliances manufacturers implement TURVAC vacuum insulation panels Turvac FG™ and Turvac SI™ in refrigerators, freezers and other similar home appliances. NOTE: Application of TURVAC® vacuum insulation panels in home appliances is a cost-effective way to achieve accordance with the Directive 2010/30/EU on energy labels, adopted on 19 May 2010 by the EU.